Finally, there is a book that reveals the truth about the worst air disaster to strike a Marine Corps fighter squadron during the Second World War. Marine Fighter Squadron 422 was a group of twenty-four typical young Americans trained to fly the famous F4U Corsair into combat with the legendary Japanese Zero. When they arrived in the Pacific, they suddenly found that not all their enemies carried guns in savage Banzai charges. Their two most dangerous and merciless adversaries were the fury of a tropical typhoon and the cold heartless whims of a Marine Corps general. 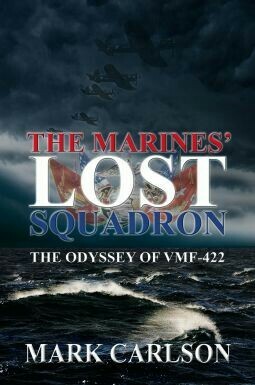 Together, these two foes seal the fate of VMF-422 and cause the greatest disaster ever to strike a Marine squadron. Aviation historian Mark Carlson has written the first full account of a group of ordinary young men who were suddenly challenged beyond their experience and which forever changed the lives of the survivors. The Marines’ Lost Squadron is the dramatic true story of a desperate and courageous fight for survival against the forces of nature and a conspiracy of silence. The Marines’ Lost Squadron is a saga of courage and conspiracy, patriotism and pride, fate and futility in a struggle to survive the ferocity of a huge typhoon in the midst of the Second World War.